‘Fruit large, roundish; skin pale greenish yellow, tinged with blush; the pulp white, tender juicy and acid; and the fruit is good for the table as well as for all kitchen purposes: in September and October. The tree is hardy and prolific.’ [FCM p.43/1845]. 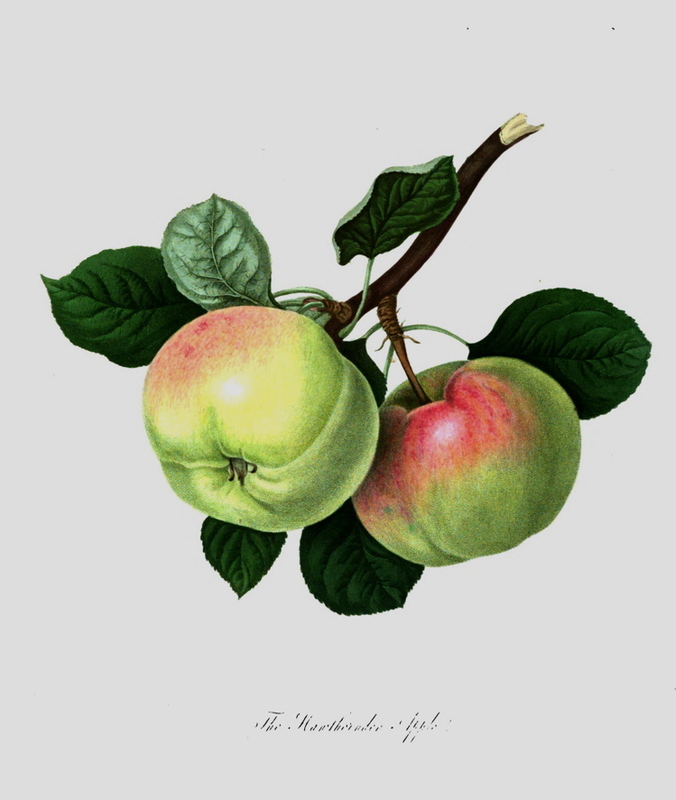 ‘This Apple received its name from the romantic spot called Hawthornden, in the county of Mid-Lothian, formerly the residence of the celebrated Scottish poet and historian Drummond, where it is supposed to have been raised; and it is extensively cultivated and highly esteemed in most parts of Scotland. In the more southern parts of the Empire, the merit of the variety is chiefly confined to early and prolific habit, for its fruit can only be recommended for culinary use, having a very delicate melting flesh, but possessing little of either saccharine or acid, to render it rich or of a high flavour.’ [PL p.282, pl.44/1818]. Fruit: variable, usually above medium in size, roundish and depressed, with occasionally a prominent rib on one side. Skin; smooth, with a delicate bloom, greenish yellow blushed red on sun exposure. Flesh; white, crisp, tender, very juicy, pleasant flavour. Raised at Hawthornden, near Edinburgh before 1790. A vigorous tree and an abundant bearer. Culinary, from October to December. [HP pl.IV/1878]. ‘One of the oldest and most esteemed varieties, and a free bearer.’ [David Crichton. NSW Hort. Mag. vol.1 p60/1864]. Listed in all catalogues [Apple no.22/1843]. There is one mention of this apple in William Macarthur’s records. March-April. Good. For kitchen only. The fruit small, unhealthy, short lived. [Notebook no.9, MP A2948]. See also HP pl.XXXIX/1878, Red Hawthornden. This could be Macarthur’s tree.